When readers post questions about genrefication in the comments, I will answer them here. Thank you so much for your ideas! Did you combine all the mythology, war, sports books you had from both the nonfiction and fiction sections, or did you just use the books from the fiction books? Thank you! I did combine all of my mythology because, previously, mythology books were located all over the library. We had them in 398.2, the 200s section, and fiction. Our reference books are already shelved in with our nonfiction section, but libraries with a separate reference section would also likely have some mythology in Reference as well. We moved all of the mythology--fiction and nonfiction--to the Mythology section. Much easier for my students now! War. That's actually an interesting one. Right now, we have nonfiction war books in the 900s section. Our fiction war books tend to be in Historical Fiction (unless they are very recent wars, which would go in Realistic fiction). Your mention of a War section is actually a great idea that has me thinking. I have students--boys especially--asking for "war" books on a pretty regular basis. That would be a great section to have, so that is definitely something to chew on. The biggest problem I see on that one is, where would you draw the line between fiction books about war and books that just take place during a war? Which books would go into the "war" section and which ones would stay in historical fiction? Many, many historical fiction books take place during wars but are not necessarily about those wars. Does that make sense? Sports is also divided into Sports fiction and the 790s section. In this case, I would not combine them since, for my library anyway, sports nonfiction far outweighs our sports fiction. The fiction would get lost among our huge numbers of sports nonfiction. As an experiment, we moved some of our 133 section (parapsychology, occult, apparitions, supernatural) into our horror section. Students did not tend to find the 133 section before, buy boy, do they find them in the Horror section! We have since relocated all our 133 to the Horror section. Now I'm having a hard time figuring out Fantasy, Fairytale and Mythology. Part of me could put them all together and another part wants to maybe have at least two sections. Care to share your definition of each one? I recently split my enormous Fantasy section into several new ones, in addition to the Fantasy splits I already had. I did a lesson and booktalk with my students describing the different fantasy subsections, and they got really into it. They asked some great questions! One of my favorite parts of genre-fication is discussing the merits of putting a certain book in this section over this other section. We have had some wonderful discussions, and I love that the students are really thinking about where books should go and why. PARANORMAL ROMANCE: anything with vampires, werewolves, angels, etc. where romance is a huge part of the plot. If it appeals to the Twilight crowd, it's in this section. FAIRY TALES: fiction novels based on fairy tales (Alex Flinn, Jackson Pearce, Cameron Dokey). I also recently moved any "princess" fantasy into this section. This would be fantasy books that have little or no magic and have princesses as main characters. Examples--The Sweetest Spell (Selfors), The Seer and the Sword (Hanley), and Legacy (Kluver). 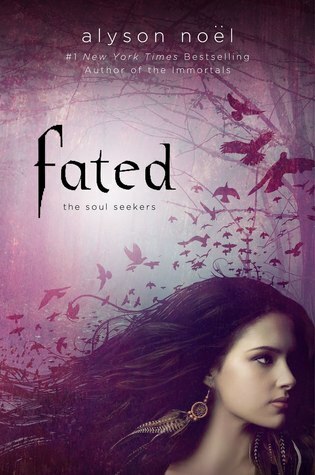 MERMAIDS--WITCHES--FAE: One of these is the protagonist. Considered adding them to PARANORMAL section, but I have tons of them. It would make my PARANORMAL section so huge, I'd ultimately have to split it anyway. I just created this section two weeks ago, and these books have been flying off the shelf. They were previously in FANTASY. Examples--Forgive My Fins (Childs), Hex Hall (Hawkins), The Iron King (Kagawa). HIGH FANTASY: Quests, tons of magic, magical creatures, other worlds, tend to be series or trilogies, magical objects or talismans. Examples--Tolkien, Narnia, Nicolas Flamel. LIGHT FANTASY: Less emphasis on magic, tend to be in our world or a world like ours. Examples--Tuck Everlasting, Plain Kate, Liesel & Po. ANIMAL FANTASY: Talking animals are the protagonists. If the book has talking animals, but humans are the protagonists, I put them in HIGH FANTASY. Examples of ANIMAL FANTASY--Charlotte's Web, The Wind in the Willows, Warriors series, Redwall series. Gregor the Overlander and Narnia both have talking animals as major characters, but since the protagonists are humans, I put them into HIGH FANTASY. How do you think it would work to use multicolored sharpie markers instead of labels? My budget is nil so I'm trying to think of cheaper options. Sharpies/markers will take you forever. What about duct tape, colored card stock, or construction paper? Honestly, the tape is the biggest expense. The labels are pretty cheap. The ones I bought came from Demco and The Library Store (both link to the exact labels I got). I bet you could find some at dollar stores with the yard sale stuff as well, but you probably won't find a huge variety of colors. Hello! I have been sitting on the fence about making this type of transformation in my school's library. I began thinking about it 3 years ago, but at that time there wasn't much on the Internet about other libraries which had done it. Now I am seeing lots of info and it is a very exciting and intriguing idea. But I have a few questions. 1. What influenced your decision to use the colored labels as opposed to using colored-spine label covers, like the Tiff Whitehead aka Mighty Little Librarian? There are more color options for the opaque labels. If you use translucent labels, you can't go too dark or the spine label underneath will not show through. Translucent labels will make it more difficult for vision-impaired students to see the spine label underneath. As a middle schooler, I needed glasses. I didn't know I needed them until my younger sister failed her school vision screening and got a pair of glasses for herself. I tried them on, and WOW. It was like I was seeing the world for the first time! I could finally see the math problems on the overhead projector, who was waving to me in the hall, and...the tiny spine labels on our library books. Yes, I remember not being able to see the spine labels in our school library and having to get really, really close to be able to see them. It is why I create my own spine labels for every book we receive in the library. My spine label fonts are as large as I can make them so that students can easily see them. The color label goes directly beneath the spine label. 2. Did you actually change the spine label to include the genre or did you only change it in the system. What the reason for your choice? I changed the spine label to include only the genre sticker and the first three letters of the author's last name. For example, Rick Riordan's The Red Pyramid appears in my Destiny system as MYTHOLOGY RIO. I do NOT include the FIC label anymore. On the book itself, the spine label reads "RIO" and the genre sticker is directly underneath it. I feel like the FIC is unnecessary with genre-fication. I realize this may be controversial, and many librarians have chosen to leave the FIC on there because that is what the public library uses. That is their choice. In my system, the section is still on the spine label (MYTHOLOGY instead of FIC). They find the section and then find the author's first three letters. It works the same way. I believe the students should learn to use the catalog rather than depend on labeling being the same in every library. Labeling is never going to be exactly the same. Our public library system uses YA, J, and EJ labels instead of FIC or F. There are also Lone Star, Bluebonnet, graphic novels, and early reader sections. The point is, if students know how to use a catalog system, they will be just fine no matter where they go. 3. I know you said to use the terms by which students ask for books, but what are you doing with books that could very easily fit into two or more genres? This is probably the hardest part about genre-fication! Many, many books could easily fit into two or more genres. When in doubt, we ask students. This doubles as a sneaky way to get students reading book blurbs and looking at book covers! We also consult Goodreads (you can see where other readers "shelved" the books--many are by genre) and other librarians who have genre-fied. For each book I review on my blog, I put a recommended genre. When in doubt, ask yourself where the book will get the MOST CHECKOUT. We had some nonfiction horror in our 133 and 094 sections. They hardly ever got checked out until we moved them to the HORROR section. Now, they are constantly checked out because the students who want them can find them in one spot. 4. What kind of books are you putting in the Realistic section? Do have specific criteria in mind?I really want to get moving on this, but this little issues are tripping me up. I will look forward to your response. The Realistic Fiction section is for contemporary "problem" fiction novels with topics such as divorce, homelessness, drugs/alcohol, gangs, bullying, parental neglect, suicide, serious illness, etc. There are other types of contemporary, realistic novels that go into other genre sections. Realistic books that are humorous in tone go into the Humor section. Realistic books that focus mainly on romance or "girl drama" (that's how my students ask for it--"girl drama") go into Romance/Chick lit. Realistic fiction that features sports as a large part of the story go into Sports. If crime or mystery are a large part of the story, they go into Mystery. Thinking about genrefying your library? Want to update your current genre labels? This set of genre labels is designed save you time and help make your genrefied library beautiful and easy to navigate. Thank you so much for your reply! I appreciate you thinking that my questions were worthy of a separate post. Your explanations have been very helpful. With this new insight, I am moving forward! Wish me luck! I hope you won't mind If contact you again as additional questions arise. Thanks, again. Not a problem! Good luck! @Nicole--I posted an answer to your question at the top of this post. We are currently genre-fying our fiction section. I'm struggling with where to put The Giver, The Messenger, and Gathering Blue by Lois Lowry. Where did you put yours and why? Thanks! Sci-fi section because they are dystopias. Do you shelve your hardcover fiction books with your paperbacks? I shelve all print fiction together in the genre sections, regardless of its format. Playaways and movies are separated into their own sections. I used to shelve playaways in with the books, but they didn't get much checkout until I moved them together. I am behind the curve here, so I apologize if this has already been cover. Did you eliminate all your nonfiction sections too? For example, do you have books that are FOOTBALL XYZ instead of 796.3? MYTHOLOGY XYZ instead of 292's? Anonymous 12:08--No, I still use Dewey for nonfiction. HOWEVER, for sections like Mythology, where they just tend to be all over the place (398.2, 200s, E, and FIC) depending on who cataloged them at Follett, I grouped the books all together with fiction and nonfiction mythology and just called it Mythology. Most of Dewey is already genrefied by definition. Hi Mrs. ReaderPants! 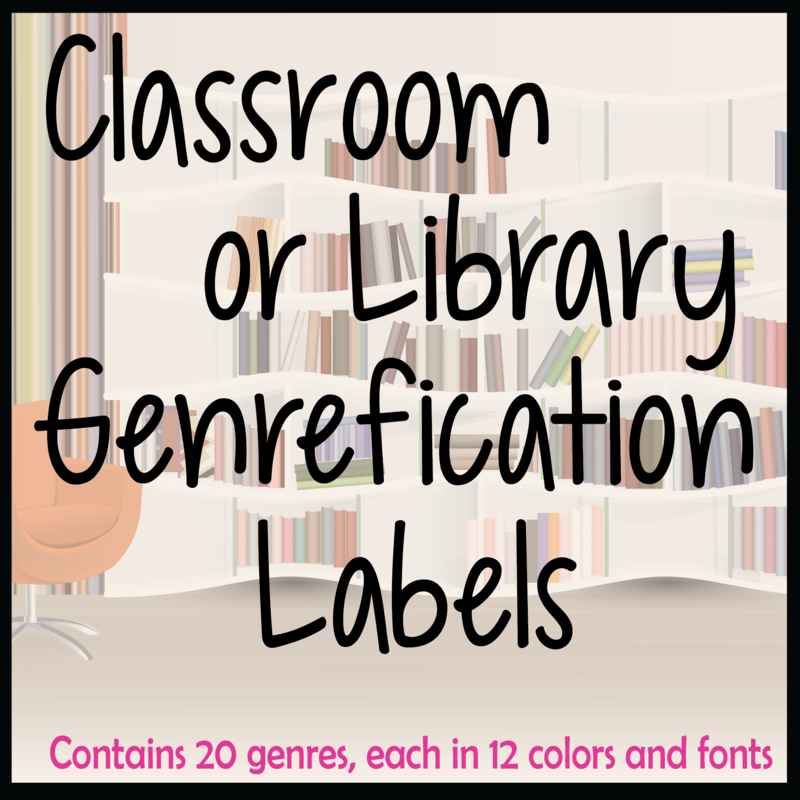 Did you create your own signage to label your genre collections? If so, would you be willing to share them, maybe on Teachers Pay Teachers? Also, I am in a K-8 library and one issue I am having is what to do with my YA fiction. It is currently in a separate area of the library. Once I create genres should I integrate all fiction or have genres in the YA section and genres in the regular fiction section. Any thoughts? Hi, Ms. G...Yes! I do have signs and am absolutely willing to share them. I've actually been meaning to upload them to TPT for awhile, but I just haven't gotten around to it yet. Oh, yes, the dilemma about separating YA. I have the same dilemma in my MS/HS library. I personally integrate mine, but my "very high school" titles have a HS label on the spine. I also designate them as a HS circulation type in Destiny. If a MS student tries to check out a HS circulation type, I get a warning message from Destiny. I do not allow the MS students to check out the HS books, but I do shelve them together.